This tutorial shows all the main steps you need to follow to create an armour or an outfit from scratch for Fallout 4. 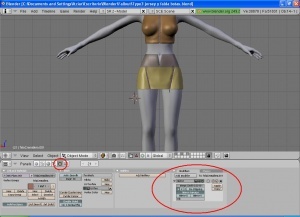 If you only want to change the textures of an existing piece of clothing or change its properties and bonus, just skip the first part of the tutorial. If you want to adapt existing armours or outfits to other bodies you will have to follow the steps explained here, except that you won't have to create the mesh (but you may probably have to adapt it to the new body), the textures or the UV maps. Currently the tools used for modelling are not completely adapted for Fallout 4, there are some steps that require some manual adjustments. This will surely change in the future months and this tutorial will be updated when required. Blender: Main tool used for creating the meshes, assigning weights and creating the UV maps. You can use the old and stable Blender version 2.49, and follow the instructions given here: Installation of Blender to install everything you need. Important: If you want to use a newer version of Blender, don't use version 2.76b, as the copy weights between meshes doesn't work properly. Install version 2.75 instead. Then you should install the Blender Nif Plugin 2.6.0a0.dev4. Take into account that this is not a official release but that it is still under development. Download the compressed file containing the nif plugin anywhere you want (remember where it is, though). Don't unzip it. 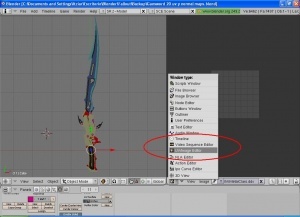 In Blender, select the menu option File -> User preferences. 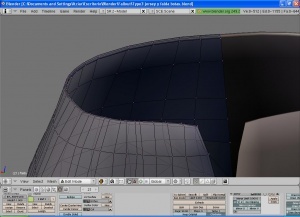 A window like the one shown in the picture Blender User Preferences will pop up. In the new window, navigate to the folder where you've sotred the zip file with the nif plugin you've just downloaded and select it. Then click the button Install from file ... in that window. 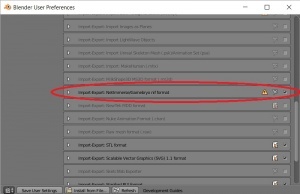 Once Blender has finished reading the nif plugin files, it will take you back to the User preferences window. There, look for the Nif plugin you've just installed (the text on screen should be like the one shown on picture Activate Nif Plugin) and check on the checkbox at the right to activate it. Then press the button Save User Settings and then close the User preferences window. GIMP: For painting textures. You can follow the instructions given here: Installation of GIMP to install everything you need. 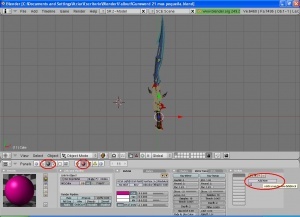 Nifskope: Used for fine tunning the meshes for using them inside the game. NifSkope 2.0 Take into account that it is not a official release but that it is stilll under development. 3ds Max: Only as a bridge between the game and Blender for importing and exporting meshes to the FO4 format. If you are a student you can get your free version of Max directly from the homepage. And 3ds Max Nif plugin: that supports the Fallout 4 nif format. Creation Kit: Downloadable from inside the Bethesda.net Launcher. Fallout 4 has simplified for modders the way of dealing with weight sliders vs. how Skyrim dealt with it. 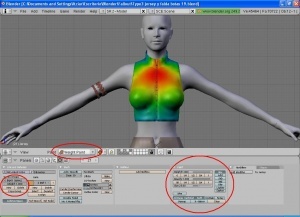 Even though you can change the character weight / shape in game, you only have to create meshes for one weight/size: the one that is in the centre of the triangle (the default one when you create a new character as shown on picture Fallout 4 armour/clothing meshes and character weight). The game deals with the rest when you move the weight slider around the triangle. When creating an outfit or an armour first thing is to decide what body you want to make the clothes for. If you want to create an armour that fits several bodies (male and female, for example) you will have to create different armours for each body. That is why the first step is to import into Blender all the parts of the body you want to work with. The nif files that contain the body meshes are in the folder \Data\Meshes\Actors\Character\CharacterAssets\. Note: The meshes and textures of the game are inside compressed files with BSA format. To extract then you can use jonwd7's B.A.E. - Bethesda Archive Extractor. 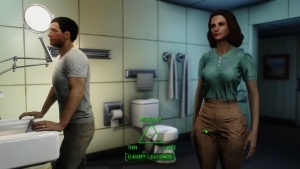 MaleBody.nif: In Fallout4 this nif file contains the torso, arms, legs and feet. MaleHands.nif: If you want to create gloves for your armour, import this mesh that contains the hands. 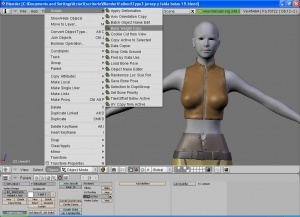 FemaleBody.nif: In Fallout4 this nif file contains the torso, arms, legs and feet. FemaleHands.nif: If you want to create gloves for your armour, import this mesh that contains the hands. Select the nif file you want to import. 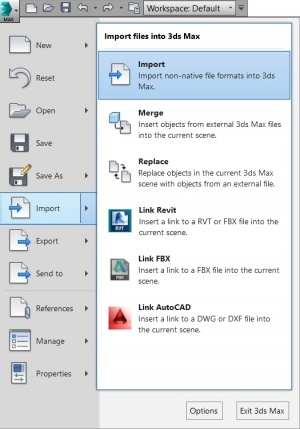 Leave the default settings for Fallout 4 in the pop up window, as shown in picture Fallout 4 import settings in 3ds Max and press the Import button. 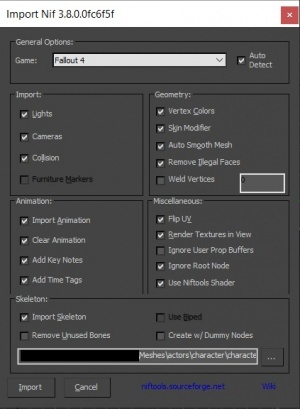 Repeat these steps for all the Fallout 4 meshes you need to import into Blender. 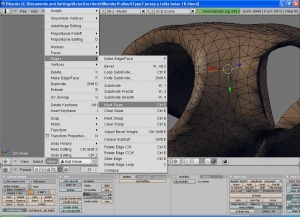 Now you can import the body parts into Blender. 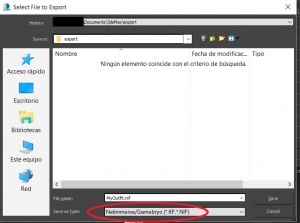 To do that use the menu option File -> Import -> Netimmerse/Gamebyro (.nif). If you cannot find that option it is because you haven't installed NifScripts. 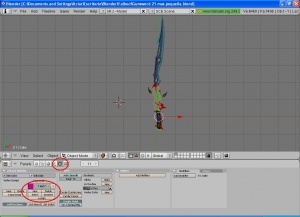 Follow the instructions given here: Installation of Blender 2.49 to install everything you need. 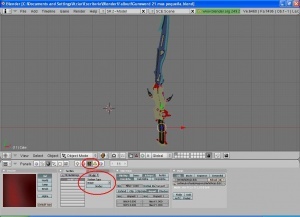 Once you have all the body parts imported into Blender, delete all the skeletons you've imported with them. To do this, select each skeleton (Scene Root) as shown in picture Deleting the skeleton, press the Delete key and select OK. You have to repeat this process until you have deleted all the skeletons you've imported into Blender. Take into account that each part of the body you import will bring its own part of the skeleton. Once you have just the body meshes, without the skeletons, it is worth you save it in a blend file you can reuse in the future (if you think you are going to create more armours or outfits). This will save you repeating this importing process each time. From now on, work in Blender as you would do for creating a mesh for any other game. This is the first step of the process. In this tutorial I am not going to explain how to use Blender to model 3d objects as there are already very good tutorials on the matter like this one: Blender 3d: Noob to pro. Once you have build your armour in Blender you can proceed to the next step. 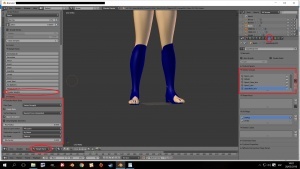 You can create a basic clothes mesh following this tutorial Creating basic clothes in 5 minutes using Blender and use it as a starting point for modelling your armour. The advantage of using this technique is that it allows you to create low polygon meshes, and therefore easier to work with, that already have the basic shape you need for your armour. Go into Object mode and select the duplicated hand (its name will be RightHand.001. You can change its name into Right glove or any other name you prefer). Go into Edit mode and scale the duplicated hand (you can use the S or Alt+S keys) to make it a little bigger than the original hand so that it covers it like gloves do. Work on the duplicated hand to give the glove its definitive shape. 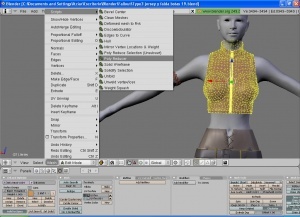 Create a mesh that covers only half of the body and make sure that the center of the mesh, in Object mode, is in the axis that separates the body in two as shown in picture Working with half of the mesh. Add the Mirror modifier (see picture Adding the Mirror modifier). In Object mode, in the Editting (F9) area click on the button Add modifier and select Mirror from the drop down list. You'll see that your object is now symmetrical and covers both sides of the body like in the picture. Work with the mesh only in one half of the body and all the changes you do there will be symmetrically replicated into the other part of the mesh. Once you've finished making your mesh press the Apply button that is beside the Mirror modifier. 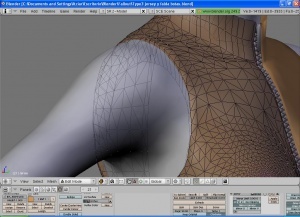 This will make your mesh real in both sides of the body (leave this step to the end, when you are sure you won't modify the mesh anymore, because once you've applied the modifier you cannot go back). It is easier to create the UV maps for the different parts of the armour as you create a UV map for each object. When you join all objects into one Blender keeps the independent UV maps you created before. It is easier to use modifiers like Mirror, Bevel or Subsurf. The modifiers apply to one object but not to other objects, so you can control much easily the shape of each part of the armour. Join all parts into one object only after having applied all the modifiers to each individual object. There are some scripts, like the one used to reduce the number of polygons, that apply to the whole object. So, if you work with independent objects you can reduce differently the polygons of the each part of the armour. 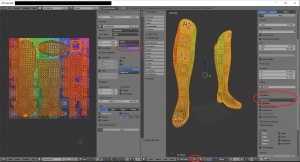 This step is exactly the same as the one explained in the tutorial Creating a sword for Fallout because it doesn't matter the shape of the mesh you are working with: you will always add a material following the same steps. While you are making the armour object or after finishing it you have to add a material to it. The game requires the material because all textures, UV maps and properties that define how it will be seen in game are to be associated to this material. 1. To create a material, in the Editing(F9) area press on the New button (the button encircled in the image Adding a material). 2. Next, in the Shading (F5) area press the red ball (Material buttons), and that will open the area that is shown in the picture Adding a texture. 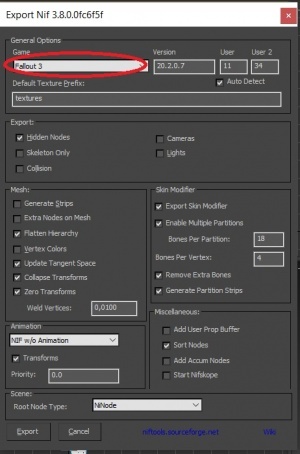 Here you can change the name of the materials on the Links and Pipeline tab, change the material properties and add a texture. The material properties can also be modified in NifSkope and it is easier to do it there, so in this screen we are only going to add a texture to the material. To do so press on the Add New button on the Texture tab. 3. Once you've added the texture two new tabs will appear: Map Input and Map To. Go to the Map Input tab and select UV as shown in the Map Input: UV picture. This is important so that the mesh interprets that the texture will follow the positions of the vertices of the UV map. 4. The last step is to associate the texture you've just created to a texture image. Right now you can associate any texture to it, it doesn't have to be the right one as this will be done later in NifSkope. 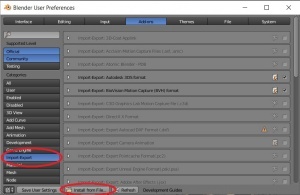 To associate the texture image press the Texture buttons (F6) as shown in the Associating an image to the texture picture, and in the Texture type drop down list select Image. A window will pop up where you can select the texture dds image and, as I've explained before at this moment you can associate any dds file you have as we will associate the right one in NifSkope later. Once your armour has the shape yo want and at least you've added one material, you have to colour it or it will be seen as transparent in game. To do this the first step is to create the UV maps. The UV maps are projections in 2 dimensions of the mesh that is a 3 dimensional object. With the UV maps you are telling the mesh what part of the texture (that is a 2 dimensional image) has to be painted on each of the faces of the mesh. Scroll down to the Shadingsection, and select Multitexturefrom the drop-down list. Blender 2.7x also provides a Color Grid that is very useful to create square UV maps. Subdivide Blender screen in two screens: right double click on the top of the screen and select Split area from the pop up menu. Then move the line until it is more or less in the middle of the screen, separating it in two sections of the same size. Select UV/Image Editor on the right screen as shown in the picture. in Edit Mode select the faces of the armour that you want to paint togheter. select the menu option Mesh -> UVUnwrap and you'll see a pop up window like the one shown in the UVUnwrap window picture. Select the option to generate the UV maps that works better for you. I usually select Unwrap or Project from View but you can try the different options and see which one fits your needs. If you use Project from View first move the armour until you see all the faces you've selected as you want them to be projected in the UV map because this option will paint them as they are shown on the screen. In armours or clothes shapes are usually complex and to paint them it is better to create UV maps of parts of each piece of cloth. Imagine this process as the cuts you'll make to a real shirt to extend the cloth completely on a table to paint it. In Edit mode select the edges that define a line. Take into account that this line wil be where two parts of the texture will join, so there will be little discontinuities in the painting along it. For this reason it is convenient that you mark the seams in places where in real life clothes already have seams or in places that will be hidden most of the time in game like the lower part of the arms. Select the menu option Mesh -> Edges -> Mark Seam (see picture Mark a seam. You'll see that the line of vertices you selected turns into a dark orange colour. Keep on creating seams in your armour until all pieces of it are completely delimited by seams. Open the menu option Mesh -> UVUnwrap and select the Unwrap option. Blender will generate automatically a UV map similar to the one shown in picture UV map generated using seams. Once you have generated all the UV maps for your armour save a file with the UV map image. You will use this file you are saving as a pattern to paint the armour textures later. To save this UV map image on the right screen select the menu option UVs -> Scripts -> Save UV Face Layout and press OK. Select the folder and enter the name of the file where you want to save your UV map on the pop up window. If you are like me it is likely that the armour you've build until now has a big amount of polygins, what translates into a big nif file and worse performance in game. A window will pop up with the default values Blender has for reducing the polygons. Try first with these values and if you see that the reduction has been too great, reload your mesh and try it again with a lower value of the parameter Poly Reduce (by default the script reduces the number of polygons by half). Press OK and wait until Blender finishes the calculations. Look at the result and if it is fines, save the blend file. You can apply the Poly reducer script as many times as you want to your mesh, but usually after 2 or 3 applications the mesh looses its original shape and looks bad. This is a very important step and is what differentiates creating armours and outfits of creating any other object for the game, as only the pieces of clothing require being weighted. The weights you are going to add to the meshes is what makes that clothes in game move with the body of the character. Each part of the armour has weights relative to the bones of the skeleton of the character. In general terms, the weight will be bigger for close bones and zero for bones that are far from that part of the armour. For example, a skirt or a pair of trousers will have zero weight with respect to the bones of the arms or hands, but will have bigger weights with respect to the bones of the legs. 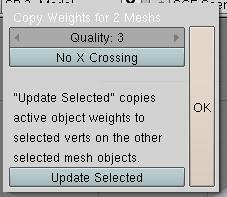 In Object mode select the object you are going to add the weights to (your armour) and on the Vertex Groups tab press the Delete button as many times as needed until there is no weight assigned to the object (see picture Deleting existing weights). In Edit mode select all the vertices of your object. To do this press the A key (if you had any vertex selected, when pressing A for the first time it will be deselected, then press A again and all vertices will be selected). Go back to Object mode and select your object first, and then select the object you are going to use as the source of the weights (to select two objects at the same time press the Shift key). You can use as a source the body you are creating the armour for, or another armour that is made for the same body you are using. Take into account that each body has slightly different weights. Select the menu option Object -> Scripts -> Bone Weight Copy (see picture Bone Weight Copy script). A window will pop up showing the default parameters for the script (see picture Bone Weight Copy script parameters). Put quality to 3 as a maximum: you don't need more quality and for Fallout meshes a higher quality value often makes the script to end in error. Press the OK button and wait a long time until the script has finished copying the weights, and then save the changes. If your armour has a lot of polygons, it will take longer for the script to copy all the weights, so if you are planning to reduce the polygon count, do that before copying the weights. If your armour is made of more than one object, repeat the process for each part of the armour, one by one. Note:In Blender 2.7x instead of using the Bone weight copy script there is a funcionality already impemented in Blender to transfer weights from one mesh to another, as shown in picture Bone Weight Copy in Blender 2.7x. IMPORTANT: this funcionality doesn't work in Blender 2.76b. Use Blender 2.75 instead. Then press the Transfer Weightsbutton again. This will create all the Vertex Gropus and copy all the weights from the source to the target object. A window will pop up showing the default parameters for the script (see picture Bone Weight Copy script parameters). Put quality to 3 and press the button Update Selected. Press the OK button and wait until the script has finished copying the weights, and then save the changes. The script will finish sooner than with the previous method because it only has to modify the weights of part of your armour. This is the most difficult and arduous method for assigning weights to an object and usually it is only required to give the finishing touches to the armour, and only when none of the two previous methods have worked completely. In Object mode select the object whose weights you want to modify. You'll see that your object shows now several colours, as shown in picture Painting weights by hand. These colours are the weights that each area has with respect to the bone you have selected in the Vertex Groups tab. The weights go from red that represents a weight of 100% to dark blue that represents a weight of 0% (see picture Weight Paint: Colour codes for weights). For example, in the picture the weights shown on the shirt are its weights with respect to the Bip01 Spine2. Weight: modifying this value you will be painting higher or lower weights (1.00 means 100%, 0.90 means 90%, and so on). Opacity: indicates if the brush is completely opaque which means that with one stroke you will change completely the weight of the area you are painting, or translucent which means that with each stroke you only modify the existing weights a little. Size: if the brush is very big you'll be modifying the weights of a big area of the mesh with one stroke. You'll see that the cursor on the screen has the shape of a brush. To modify the weights of your armour simply select the bone whose weights you want to modify on the Vertex Groups area and paint with the brush on your armour. If you want to modify the weights of more than one bone you will have to repeat the process for each bone, selecting it in the Vertex Groups area. This page was last edited on 11 February 2019, at 01:34.